Your family’s littlest smiles deserve special attention from Dental Expressions. Children need extra protection from all the stresses of life, and this includes the possible stresses on their smiles. Your kids are especially cavity-prone during the younger years, when they haven’t yet developed the knowledge and ability to practice truly thorough home hygiene routines. Children’s dentistry is a lot like adult dental care in many ways. We provide cleanings and exams to prevent oral health problems and look for issues. But children’s dentistry includes special attention for even greater prevention of decay. At Dental Expressions near Kaukauna, WI, we can provide the special attention your child’s smile needs. Many people ask when they should first bring their child in for a children’s dentistry visit. You can bring your child in as soon as his or her teeth begin to erupt, but you should definitely bring your child in no later than age one for that first visit. At age one or within 6 months of your child's first tooth erupting, we recommend a "Dental Home" visit to evaluate your child's developing teeth and growth for current or future issues. At this time, we also discuss care tips. Every child is different, and if their cooperation allows a cleaning, we'll also do this at this time. 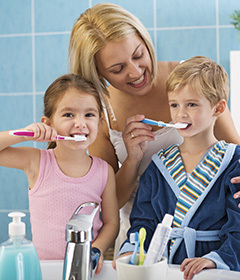 We recommend that you begin brushing your child’s teeth from the moment that the first one erupts as well. You can use a very soft bristled brush specifically designed for kids and a very tiny amount of fluoridated toothpaste. Even a child’s baby teeth need to be cared for because these teeth are vital for oral development. During your child’s first visit, we will take extra care to get him or her comfortable with the sights and sounds of the dental office. Trips to the dentist don’t need to be a scary experience! Our dentists have a lot of experience with kids – they have four of their own – so they understand how to ease your child into dental visits and make the experience fun. As children grow past this first appointment, there are a number of ways we’ll enhance their dental care. The tops of your child’s teeth, especially the molars, aren’t smooth. They’re creviced, and these crevices make great places for decay-causing agents to grab hold and hide. It’s hard to reach these crevices with a toothbrush, especially for kids who are just learning to care for their own teeth. That’s why dental sealants are a part of children’s dentistry care. Dental sealants are made of tooth-colored plastic and cover these crevices to keep out cavities. We’ll place dental sealants on your child’s permanent molars between the ages of 6 and 12. We will check on the state of your child’s dental sealants at each children’s dentistry checkup to make sure they don’t need to be reapplied. Dental sealants typically last between 2 and 4 years. We also provide fluoride treatments to strengthen your child’s tooth enamel against decay. If your child plays sports, we will want to create a custom mouthguard for him or her. Protecting your child’s teeth is the whole point of children’s dentistry care, and custom athletic mouthguards provide better protection from sports injuries than do other types of mouthguards. If your child needs a children’s dentistry appointment, contact us for an appointment. Families from all of the Fox Cities, including Appleton, visit Dental Expressions for their dental care.